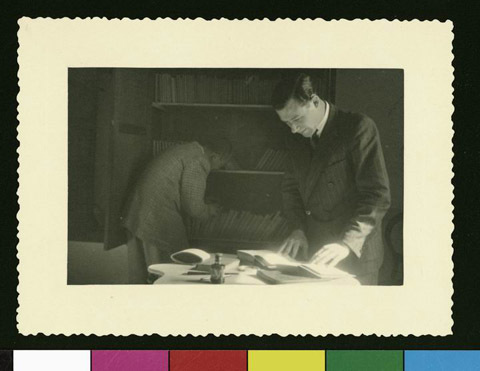 JDC - Archives : Two men in the library for interned refugees in Ericeira. Search > Search Results > Two men in the library for interned refugees in Ericeira. Title Two men in the library for interned refugees in Ericeira. Description A library of several hundred books have been organized by Dr. Rosenfeld, one of the refugees, who is also the head of the school. Books in the library are in Portugese, German, French, English, Spanish, Yiddish and Hebrew. Portugal opened a detention center in Ericeira, and JDC paid the maintenance costs for the interned Jewish refugees.